I know it’s awfully tempting to consult any old thesaurus you can use for free on the Internet but today I’m going to ask you to consider something different. Try Visual Thesaurus. It works with mulit-definition words. 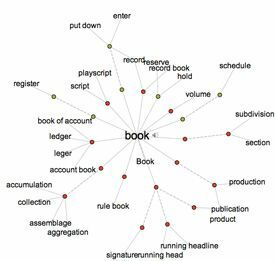 When words have more than one meaning (for example: “book” referring to an object you read and “book” referring to making a reservation) it intelligently groups the synonyms. This makes it faster to select the one you really want. It offers lots of bells and whistles: You can leap from word to word, easily engaging in new searches even on the synonyms, with a simple click. There is colour coding for different parts of speech. You can hear the words pronounced, if you like. Right click on any word and you can search the Internet for it. Subscriptions are $2.95 per month or $19.95 per year. That’s less than a cup of fancy coffee per month. Plus you can try it out for free. Why don’t you go do that right now?